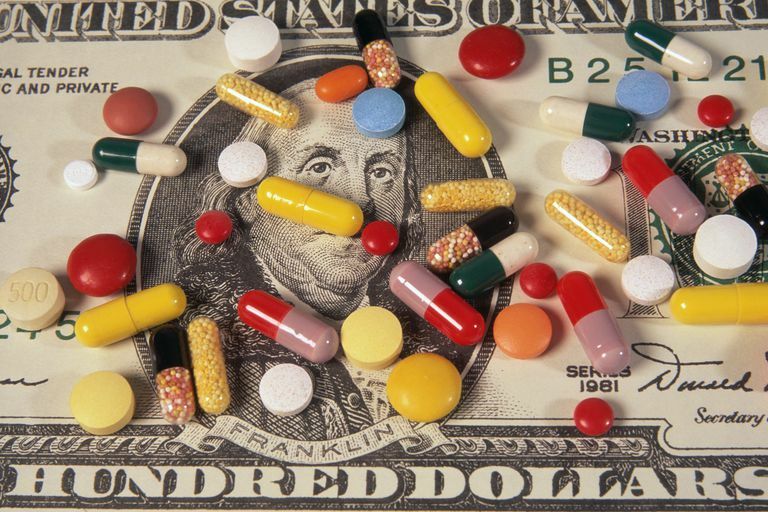 Generic drugs can save you lots of money on prescription costs. More than 50% of all prescriptions in the United States are filled with generic drugs. How Much Can I Save if I Switch to a Generic Drug? Generic drugs can save you up to 80% on the cost of a prescription when compared with the brand name drug. Most often, the savings range from 30% to 50%. According to the National Association of Chain Drug Stores, the average retail price of a generic prescription drug in 2008 was $35.22. The average retail price of a brand name prescription drug was $137.90. The average retail price of 20mg Pravachol, a drug used to treat high cholesterol, is $132 for a 30-day supply. The same amount of pravastatin, the generic version of Pravachol, can be purchased at Wal-Mart, Target, and other large chain stores for $4, a savings of more than $1,500 a year. The average retail price of 500mg Glucophage, a drug used to treat type 2 diabetes, is $204 for a 90-day supply. The same amount of metformin, the generic version of Glucophage, can be purchased at chain stores for $10, a savings of more than $750 a year. I Have a Health Plan with Drug Coverage. Can I Still Save on Generic Drugs? Yes. Most health plans with drug coverage pay for medications based on a drug formulary. A drug formulary is a list of preferred prescription drugs, both generic and brand name. Each time you have a prescription filled you are responsible for copay, which is your share of the cost of the prescription. Drugs on a health plan formulary are usually grouped into tiers, and your copay is determined by the tier of your medication. A typical drug formulary includes three tiers. The first tier has the lowest copay, and it usually includes generic medications. Medications in tier 2 and tier 3 are brand name drugs with higher copays. For example: In a large health plan in the Northeast, Zoloft, a medication used to treat depression, is in tier 3 and has a copay of $55 for a 30-day supply. The generic version of Zoloft, sertraline, is in tier 1 and is $10 for a 30-day supply, an annual savings of $540. Why Are Generic Drugs Less Expensive Than Brand Name Drugs? Since generic drug companies do not have to develop a medication from scratch, it costs significantly less to bring the drug to the market. Once a generic medication is approved, several companies can produce and sell the drug. This competition helps lower prices. In addition, many generic drugs are well-established, frequently used medications that do not require expensive advertising. Can I Get a Generic Version of Any Medication? No. The U.S. Food and Drug Administration (FDA) provides patent protection for pharmaceutical companies that pay for the research, development, and marketing expenses of a new drug. When the patent expires, other pharmaceutical companies, once approved by the FDA, can start making and selling the generic version of the drug. According to the FDA, more than 70% of drugs listed in the FDA’s Orange Book (a list of all products that have been approved by the FDA) have generic counterparts. Generics are readily available to treat many common health conditions, and more than 50% of all prescriptions in the U.S. are filled with generic drugs. Can I Change My Treatment to Include a Generic Medication? Yes. Depending on your health condition and the drugs that are available to treat that condition, your doctor may be able to switch you to a similar medication that has a generic version. Some of the most common health conditions, including high cholesterol, depression, allergies and diabetes, have generic medications available. Example: Lipitor, a medication used to treat high cholesterol, is still on patent protection and does not have a generic version. It has an average retail price of about $142 for a 30-day supply. If it is safe and appropriate, your doctor may switch you to pravastatin, the generic version of Pravachol, which costs $4 for a 30-day supply at Wal-Mart, Target and Costco, an annual savings of more than $1,600. Yes. Generic drugs must use the same active ingredients as the brand name version of the drug. A generic drug must meet the same quality and safety standards. The FDA requires that a generic drug be the same as a brand name drug in dosage, safety, strength, the way it works, the way it is taken, and the health conditions it treats. However, some doctors and consumers have concerns about using generic drugs. There have been reports to the FDA about side effects and lack of effectiveness of some generic medications, including some drugs used to treat low thyroid, epilepsy, and depression. Before switching to a generic drug, speak with your healthcare provider and make sure that you are both comfortable with the change.